Welcome to our new blog which aims to help you memorise and understand the hadeeths collected by Imam an Nawawi (may Allaah have mercy upon him) in his book of 40 hadeeths. There is a 50-lesson plan which will take one year to complete inshaa Allaah. Every fifth week is revision so there are really only 40 lessons of new material. 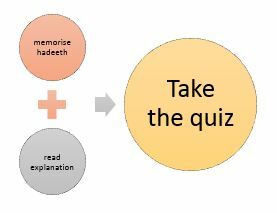 If memorising the full hadeeths seems too daunting a task, you can read Shaykh Al-Uthaymeen’s explanation and answer the questions in the short quiz (10 questions a week) without memorising. If you can only spare 5 minutes a week and can’t read the Shaykh’s explanation, just take the weekly quiz and pick up a few golden nuggets from the hadeeths that are famed for covering the major topics in the religion of Islaam. A new quiz is emailed out every Friday to those who follow the blog (see right of page or the very bottom), starting from the last Friday of September 2013 when the first quiz will be emailed out inshaa Allaah. Your email address will not be used for any other purpose inshaa Allaah. Corrections made to Lesson 3 Quiz on 24th October: translation of hadeeth changed from "[Ihsaan] is that you worship Allaah as if you see Him" to "as if He sees you", and question 7 wording about the previous scriptures changed from "it is impossible to tell which parts are true and which ones are false" to "It is impossible to tell which parts are the direct words of Allaah and which are not." Corrections made to Lesson 11 Quiz January 2014. Question 1 answers were previously in a muddled order. BREAK FOR RAMADAN ! ! ! May Allah reward everyone in their endeavors to study and Learn these Hadeeths. I ask Allah to guide me upon the truth along with my Brothers and Sisters. Insha Allah i will complete this study with the Guidance of Allah (SWT). Assalaamua alikum wa rahmatullaahi wa barakaatuh. Aameen to you duaa. I hope it is still going ok.
As salaamu alaykum wa rahmatullaahu wa barakaatuhu ukhti! Alhamdulillaah ! This is just great……..i am so so happy .May Allaah grant me & you success in seeking knowledge + implementing solely for HIs sake ,aameen! & may Allaah grant you the best of of this life & hereafter,Allahumma aameen! SubhanAllaah i am soooo excited when it comes to quizzes…….i am assuming you had to buy the Proprofs software..
Assalaamua alikum wa rahmatullaahi wa barakaatuh. Aameen to you duaa. Subhan Allaah , i am so excited when it comes to quizzes…….i am assuming you had to buy the Proprofs software …. Assalaamua alikum wa rahmatullaahi wa barakaatuh. Sorry, I forgot to approve your comment when I replied to you last time! Hope it’s still going ok.
Assalaamua alikum wa rahmatullaahi wa barakaatuh. Please let me know how it’s going. If you are getting stuck, let me know. May Allaah help us all in this task! Aaameen. Assalaamua alikum wa rahmatullaahi wa barakaatuh. You have to type your email address or wordpress username near the button that says “Follow”. They email you to ask you to confirm that you do really want to sign up. You have to agree to that by clicking on the email they send you. Sorry, I can’t add names on myself! Assalaamua alikum wa rahmatullaahi wa barakaatuh. Please let us know how it’s going. Hope it’s going ok. If you get stuck, let me know. May Allaah help us and you! Aameen. Assalaamu alaikum wa rahmatullaah. I have invited you to follow the blog. They should receive an email asking you to confirm that you want to follow it. Please click on the link to agree. I hope it works! May Allaah reward you for your interest and I hope that the basic quizzes live up to your expectations. Assalamu aleykum warahmatullahi wabarakatuhu…..am unable to subscribe to this website…and am really interested… I need help! Assalaamu alaikum wa rahmatullaahi wa barakaatuh. I sent you an invitation to join. It should reach you be email. Please click on the link in that email. May Allaah reward you with good! MasyaAllah. Keep up the good work. May Allah reward you immensely. Please notify me of new quizzes and lessons via my email. Did I miss lesson 37? I haven’t received it yet. Assalaamu alaikum. Sorry for the delay. I will be posting the quiz up tonight inshaa Allaah. Sorry for the trouble. Glad someone is following these!